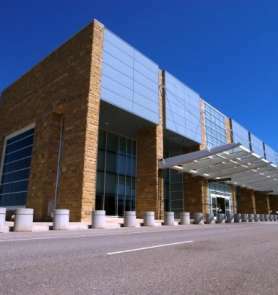 Knoxville’s McGhee Tyson Airport is the premier air facility serving East Tennessee. Located just 12 miles from downtown Knoxville, McGhee Tyson Airport is one of the most convenient and accessible regional airports in the nation. For updated flight information, visit flyknoxville.org. 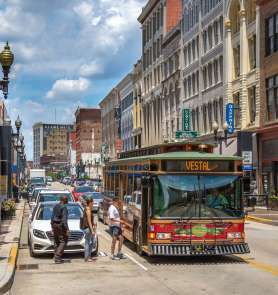 Knoxville is proud to offer free trolley service downtown and to the nearby University of Tennessee campus. Stops include hotels, the Knoxville Convention Center and area attractions. Trolleys run until 6:00 p.m. on weekdays and offer late-night service on weekends. The city also offers several options for your private charter needs. Group transportation, including taxis, intercity travel and shuttle services are available from several vendors. Vehicles range in size from sedans to 56-passenger long-distance coaches. Lastly, Knoxville provides a number of convenient parking options. Guests can park for FREE in the city-owned Market Square, State Street, Locust Street and Dwight Kessel garages (and at meters) after 6 p.m. weekdays and all day Saturday and Sunday. View more information on downtown parking. Knoxville offers several options for your private charter needs. Group transportation, including taxis, intercity travel and shuttle services are available from several vendors. Vehicles range in size from sedans to 56-passenger long-distance coaches. Knoxville provides a number of convenient parking options. Guests can park for FREE in the city-owned Market Square, State Street, Locust Street and Dwight Kessel garages (and at meters) after 6 p.m. weekdays and all day Saturday and Sunday. For more information on downtown parking, click here. Charging stations are also located throughout the city for your convenience. 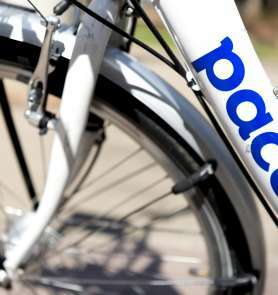 To ride Pace, riders simply download the free Pace bike share app, available in the App Store or Google Play. Riders find available bikes and parking locations in the app, and can unlock bikes at the touch of a button. 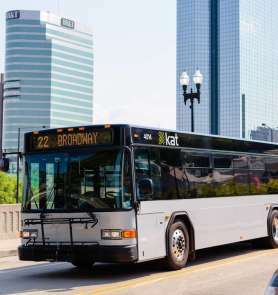 Pace rides in Knoxville cost $1.50 per half hour, and the first 30-minute ride for every new user is free.